Replication software allows complete copying of some data to another place. 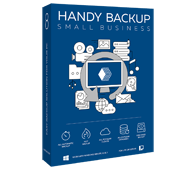 Handy Backup provides full automation for these actions, serving as data replication solution via its backup and restore plug-ins that can automatically copy any data to any place needed. With its different plug-ins. 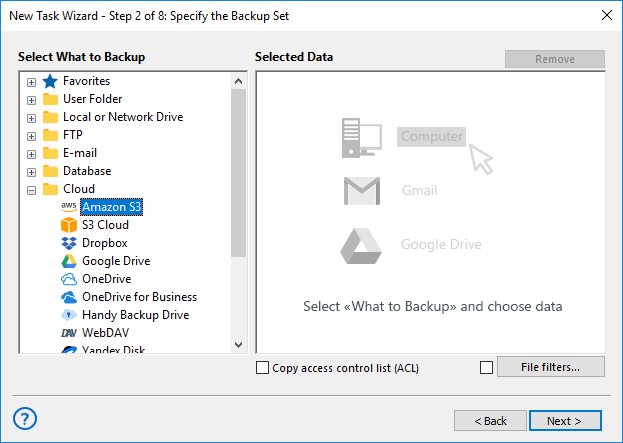 Handy Backup gets an access to almost any data and storage type existed for secured, automated data replication, including files, folders, databases (e.g., backup MySQL, MS SQL), virtual machines, websites, clouds (Google Drive, Amazon S3, OneDrive) and much more. Using the plug-in system and file filters, Handy Backup can save and restore any data of any type, providing automating for a data replicator task. 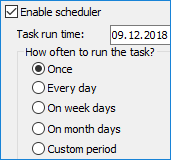 In addition, a user can schedule any task to run automatically at an exact time and with a pre-defined repeating period, or by a system event. Serving as data replication tool, Handy Backup allows internal data and traffic encryption, using secured FTP and cloud storages, informing users about all program actions via emails or a GUI, as well as running missed tasks and starting other software (including security utilities) before or after a task. How to Make Data Replication with Handy Backup? These are the two variants of data replication: one for moving data to some storage, and another to saving a data copy onto another data source. Storages: there are the clouds, FTP servers, NAS units, external and network drives and local disks to serve as storages. The primary feature of storage is its designation for saving data. Data sources: despite that any storage can serve as data source in Handy Backup, all objects not designed for storing the raw information (e.g., a database or a virtual machine) is a source. The Small Server edition can serve as data replication software for any data type, including commercial clouds, databases and virtual machines. The way to do it when using Handy Backup as replication software is quite simple. Open Handy Backup. 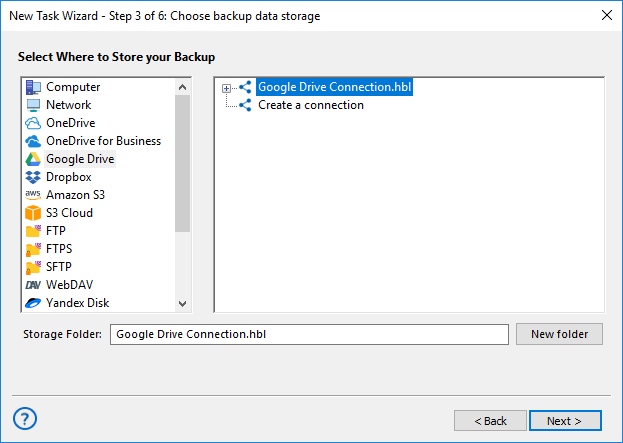 Create a new backup task with a button or a menu item. On the Step 1, select the backup task type. Move to the Step 2. Select here the data source to apply the task as a data replicator. On the Step 3, select storage to replicate the information. On other steps, tune up your task (to schedule running, encrypt data and so on). Finally, give your task a name. That is all! Each time you will run a task, you will automatically process your data replication to selected storage. 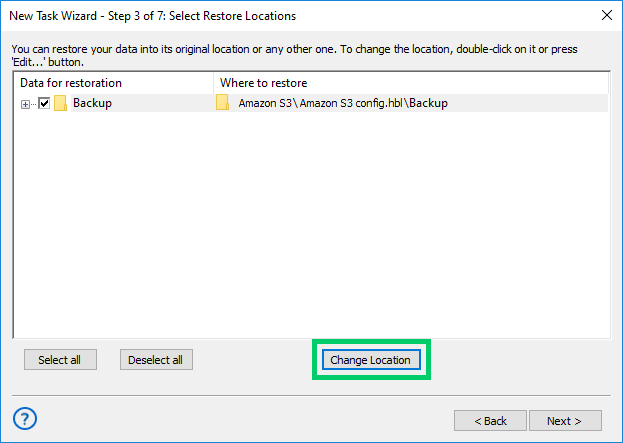 Note: To make data replication between storage folders, you may use the synchronization task (make it on the Step 1, and just select storage folders on the Steps 2 and 3). This method simplifies data replication operations, but it also lacks some additional instruments of security and efficiency. Open your storage on the Step 2, and in the backup folder, find a file backup.hbi. Select this file. Click "Next" and go to the Step 3. On this step, click onto the button "Change location". Select the data source connection (or create a new one) to replicate data to it. Click OK.
Continue creating a restoration task as described in the User Manual. Note: You can automatically delete your temporary file copy after data replication by running a command after a task. You may also schedule replication software actions by running a backup task and a restore task after a few time needed to complete a backup part of this operation. Try to use Handy Backup as your trusted data replication solution! Download a newest version of Handy Backup with all plug-ins and functions for a 30-day free trial period!